Now Reading: Harvest Is On The Horizon: Are You Ready? After a busy growing season of keeping an eye on all aspects of your crops, it’s time to focus on a safe and successful harvest. You may have read my recent blog post where I offered some helpful tips to consider as you begin to think about harvest this fall. I’d like to dig in a little deeper, talk about some exciting developments, and take a look at what’s new with Climate FieldView™ this fall to make sure you are ready when it’s time to head into the fields for harvest. More combines are Climate FieldView™ compatible – The Climate FieldView™ Drive is now compatible with over 65 percent of combines in the U.S., including newly added connectivity with CLAAS Lexion (learn more) and New Holland (learn more), and others, including Gleaner, Massey Ferguson and Challenger combines coming soon (learn more), and most planters in the United States. You can find out if your combine is FieldView™ Drive compatible here. Even if you cannot connect to Climate FieldView™ live in the combine cab, you can easily import your yield files through the FieldView™ Data Inbox (learn more). Yield analysis enhancements - With our enhanced yield analysis tool, you can make every field a test plot and identify what inputs worked and which ones didn’t across your fields to help make decisions with data from your farm. This fall, you can create and save areas within individual fields to determine how different agronomic practices affected yield performance. All too soon, we will be looking ahead to next season. By utilizing the FieldView™ yield analysis tool, you can make the most informed decisions going into the coming year. Seed, fertility, crop protection, and agronomic decisions are much easier when you have information at your fingertips about how these inputs influenced yield and how they were affected by your management practices. 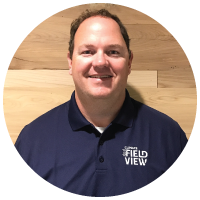 Don’t upgrade to iOS 11 on your iPad® mobile digital device or iPhone® mobile digital device until we notify you that it is FieldView™ Approved. Learn more by clicking here. Are your Climate FieldView™ and Climate FieldView™ Cab app updated to the latest version? Be sure by checking for FieldView™ and FieldView™ Cab app updates on your iPad® device now. Is your planting data in your FieldView account? Having your planting data along with your yield data gives you the ability to assess your hybrid placement and performance and assist you with some of your agronomic decisions next season. To learn more about uploading planting data into FieldView, click here. Are your iPad® device and FieldView™ Drive or Precision Planting 20/20 YieldSense® properly connected? For connectivity information with FieldView Drive, click here. For connectivity information with Precision Planting 20/20 YieldSense®, click here. Is your combine set up in the Climate FieldView™ Cab app? Getting your combine set up prior to harvest ensures you will be ready to go when it is time to harvest your fields. Learn more now by clicking here. Will you be able to work your fields for harvest? Climate FieldView™ rainfall reports provide field-level rainfall estimates so you can see if your fields are dry enough for harvest. Learn more now by clicking here. Need to manually upload your harvest data? You can manually upload via the data inbox and view your yield maps. Learn more now. Are you ready to share your harvest data with your trusted agronomy partners to help you make the best decisions for next planting season? For more information on sharing, click here. Have questions about how to get prepared for harvest? Join one of our free, interactive webinars to get a detailed demonstration of how to install Climate FieldView™ Drive, how to set up the FieldView™ Cab app, how to import planting or harvest data and how to use the yield analysis features. Register for Climate FieldView™ webinars at climate.com/webinars. Good luck and have a safe and successful harvest. If you have any questions, feel free to contact the Climate Support Team at (888) 924-7475 or support@climate.com.